Flo's back at it again, but is this latest outing worth taking a look at? Glu Mobile reinvigorated Flo for a new generation of gamers with last year's Diner Dash 2015, and did a decent job of adapting the title to a free-to-play structure that made sense. While it still featured some frustrating mechanics such as paywalls and other F2P trappings, it was still a pretty positive experience. 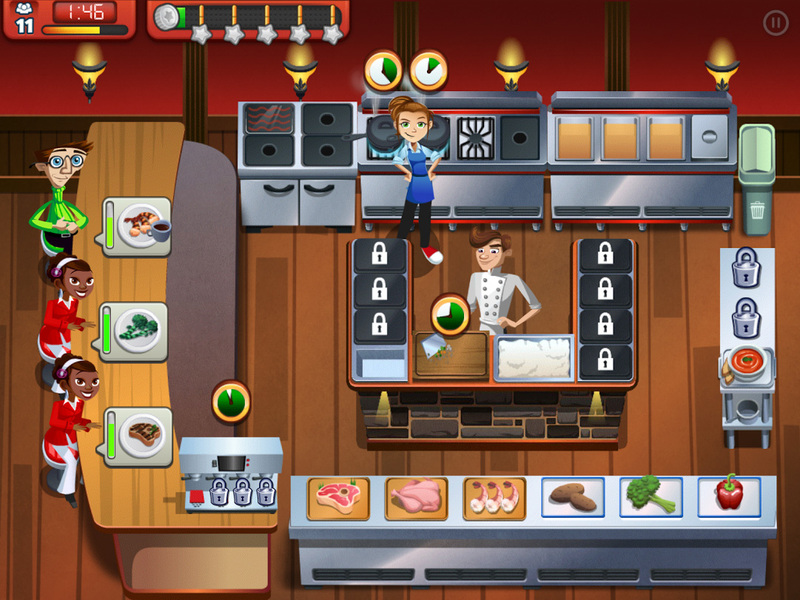 Flo's back with the release of Cooking Dash 2016, which takes many of the mechanics from Diner Dash and translates them into enjoyable tasks for you to complete -- unfortunately, microtransactions do start getting in the way of things after a time. It's your job to run a restaurant as Flo, and you've got to feed hungry customers one after the other as they start filing in and ordering dishes. Starting out, you'll have only a few cooking stations open, but as you progress you'll be expected to man more. The game is keen on tossing customers your way that it knows you'll have trouble accommodating, however, so you're ever-so-gently nudged toward spending money in-game if you want to do well. It's a pretty nefarious scheme Glu Mobile has going on, but there's still fun to be had even if you're only playing in bite-sized chunks here and there. The fun lies mainly within creating and figuring out how best to serve each dish the customers ask for. You've got to decipher the best order you have to cook each dish in, what the quickest route is to getting the patrons' food to them, and what to do to ensure you're getting things done quickly enough. You need some ridiculous time management skills to do well, but for players who specialize in that type of thing, it won't feel much different than other mobile departures. It's possible for you to unlock extras that you need with the currency you're given in-game. You can get more by completing levels and besting the game when it tosses seemingly impossible odds at you so much that you have to artificially upgrade your game both cosmetically and functionally. Cooking Dash 2016 is a very colorful and functional game, especially for those looking to try out another title with Flo and similar mechanics to Diner Dash. It may need to tone down its constant need and requirements a bit, but in all, it's a worthy play if you want to experience the thrill of running a restaurant without the financial burden.